The Big Data Value Association (BDVA) is organizing its first Summit in Madrid from 17th till 19th June 2015. 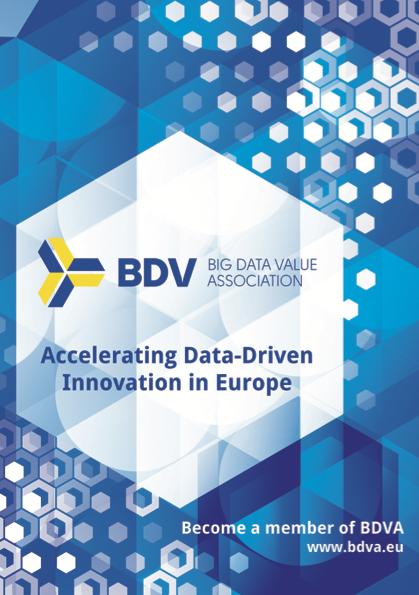 The aim of the BDVA Summit is to inform about the BDVA activities, present the main expected funding opportunities in the field of Big Data and to set-up dialogues to discuss opportunities and challenges offered by Big Data among the European Big Data Community. The Summit is expected to foster the networking and cooperation on research, development and business innovation around Big Data. "Data? What to do? Why me?" There will be an exhibition corner to give Big Data vendors, integrators and organizations the chance to present their solutions to attendees, build new collaboration opportunities and organize face-to-face meetings, even in the context of cPPPs. The exhibition corner will be accessible during conference breaks and at lunch. Each booth will be equipped with a desk and a stool/chair, in order to allow exhibitors to display their material, such as presentations and demos on their laptops, giveaways and leaflets. There will also be the possibility to expose a roll-up (max dimensions 120x200 cm). The exhibition space will be equipped with electrical charge and wifi. The booths will be allocated on a first-come-first-served basis, giving priority to BDVA members. This service is free of charge. Email to Paloma García: Paloma.garcia@melia.com. Booking reference: 31090155. Email to Lorena Alcocer: lorena.alcocer@melia.com. Booking reference: 126.943. More info will come soon on the BDVA web site. Save the dates and stay tuned.